Have recent celebrity suicides left you with a deep sadness and wonderment at what it takes to go that far into depression? Those are common thoughts when we hear the news that someone was so overwhelmed by life’s difficulties that suicide seemed the only answer. The good news is that hope is available for anyone who needs it, and life is full of possibilities for connection and support—and yes, creativity that brings joy, mindfulness, satisfaction, and peace. Dr. Caroline Giroux is a psychiatrist who migrated from Canada and is now Associate Professor at UC Davis. Through narrative approaches, she has the privilege to witness her patients’ growth and be inspired by their resilience. Apart from addressing the impact of traumatic experiences throughout the lifespan, she is an educator, an academic writer, an essayist, and a poet. She channels her creativity by designing teaching tools such as courses on mood disorders for medical students and a monthly newsletter for residents She is the mother of three spirited sons and has no shortage of opportunities to express her creativity through kids’ stories and various family projects. 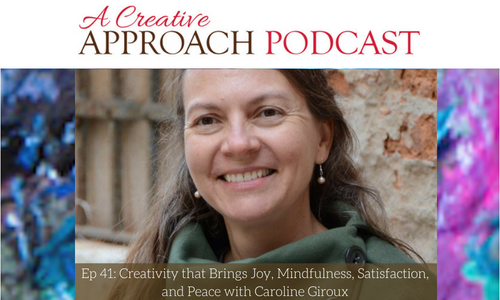 Caroline is a creative physician who writes professionally and personally. She shares some of her poetry and essays in Sierra Sacramento Valley Medicine, the official journal of the medical society by the same name. This lifestyle journal promotes the history, art, and science of medicine, the protection of public health, and the well-being of patients and their caregivers. I have the privilege of serving on the editorial committee of the journal with Caroline and am happy to share this conversation with you.